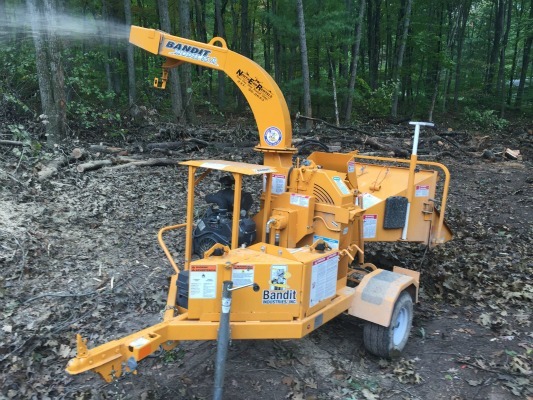 The Bandit Model 65XP Wood Chipper is a compact, 6 inch capacity disc style wood chipper that's portable enough to use around your home but powerful enough for commercial projects. Although the model 65XP is the smallest unit in their line, don't let the size fool you, this wood chipper is amazing! 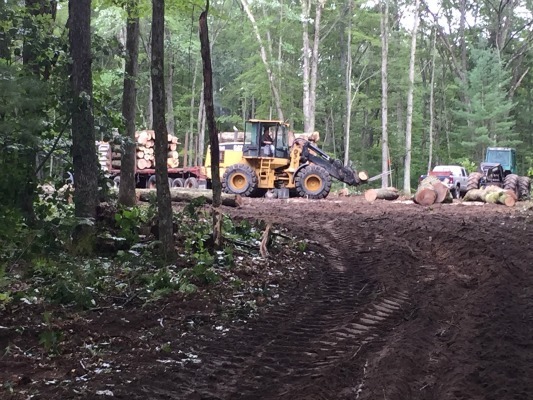 Due to a recent construction project we had a logging company come to our property and create a building site for a new home in the middle of dense hardwoods. The trees were mainly large white oak and black oak and a majority of the trees were estimated at about 100 years old. The trees were sold to the logging company and in return we received a decent amount of money plus a section of the woods was cleared and stumped to create a beautiful building site for a new home. Here's the problem. After the trees were harvested there were tree tops everywhere. The tops were close to the building site and needed to be cut up and removed from the site. Since I'm passionate about firewood I definitely didn't mind all of the oak firewood I was going to get from cutting up the tops, but I was really concerned about all of the brush that would be left over. The last thing I wanted was a bunch of huge brush piles laying around a new home and since it was located in the woods, burning the brush piles was not an option. So, I decided to rent a wood chipper to chip the tops. Since we were in the process of building a new home, I needed a way to remove the brush without spending a lot of money. Buying a new wood chipper for a single use project was out of the question so I decided to look for a rental unit at a couple of nearby rental stores. Luckily, one of the rental stores had a Bandit Model 65XP wood chipper for rent that was in like new condition. The unit only had 275 hours on it and it cost me $145 for 24 hours of rental time. I didn't mind spending $145 for a full day with the chipper, but I was a little hesitant on whether or not the chipper was big enough to handle such a large project. I needed to complete the project in 1 day and I estimated I needed to chip about 30-40 tops plus a bunch of random branches left over from the logging. This picture shows the area that was cleared for the building site. All of the small trees and tops were pushed off to the side of the building site and needed to be cut up into firewood and the remaining branches needed to be chipped. The Bandit model 65XP wood chipper that I rented had a 27 horse power Kohler engine with a single feed wheel. The chipper opening measured 6 inches tall by 12 inches wide, it also had a large in-feed opening to contain the large, multi branched tops. The unit came equipped with an automatic starter which was really nice, and it had large 14 inch tires which made towing the chipper behind my mid sized SUV really easy. It also had a large chute that rotated to adjust the direction of the wood chips and you could adjust the pitch to either blow the chips into a pile or broadcast them over a long distance. In order to run the wood chipper, you definitely need hearing and eye protection. The chipper is extremely loud and flying wood chips could easily injure your eyes. We had 3 adults (including myself) for the project. The plan was to have one person limb the tops, one person would drag the tops to the chipper and one person would feed the wood chipper. In the first 5 minutes of running the chipper I knew we made a good choice. 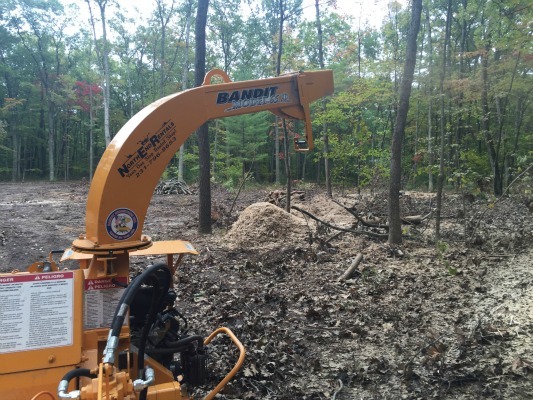 The Bandit wood chipper is absolutely amazing! The power of the feed wheel is unbelievable. Plus, the unit has an auto feed feature which adjusts the feed wheel to the engines RPM's. Basically, you put the limb into the feed wheel and if the engine bogs down too much the feed wheel will pause, and re-engauge when the RPM's pick back up. This allows you to simply stick a limb into the chipper and walk away....the chipper will do the rest! This is a great feature because you don't have to worry about plugging up the machine and you can walk away to grab another branch to consistently feed the chipper. With one person cutting and another person dragging the limbs, we had to work really had to keep up with the chipper. I expected we would cut faster than the chipper could chip, but I was wrong. Plus, as an added bonus the chipper didn't use as much gas as I expected.....another great cost savings! We started chipping at 9:00 am and we were completely finished by 4:00 pm. 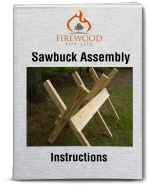 What I originally thought was an impossible task that would take several days to complete was easily finished in one day thanks to the Bandit model 65XP wood chipper. 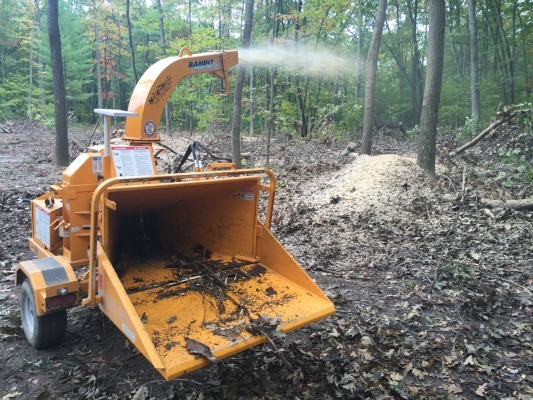 I am very impressed with the power, easy operation and overall experience with the Bandit model 65XP wood chipper. The small unit is easy to haul and operate and it's powerful enough to handle large scale jobs. 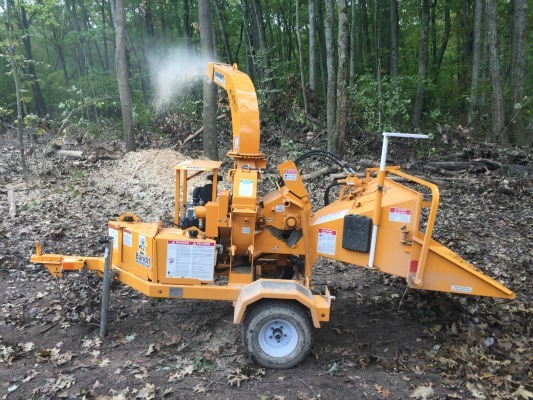 Whether you're looking to buy a wood chipper for continual use or you simply need to rent one for a one time job you should consider the 65XP, you won't be disappointed.